Point Loma, Ocean Beach and Sunset Cliffs are established neighborhoods located in central coastal San Diego. 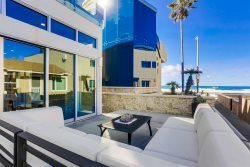 Visitors here will experience everything from quiet tree lined streets, historic residential neighborhoods, expansive views of San Diego Bay and Downtown San Diego, and scenic shorelines and sandy beaches. Vacation rentals in these neigborhoods are located very close to all of San Diego's top attractions, like Balboa Park and museums, the San Diego Zoo, Old Town, The downtown Gaslamp District, San Diego Convention Center, and the San Diego International Airport.